How to Install CX_Oracle for Python on Windows? Check Box Mapping of Other Values in Oracle Forms specifies how any fetched or assigned value that is not one of the pre-defined “checked” or “unchecked” values should be interpreted. 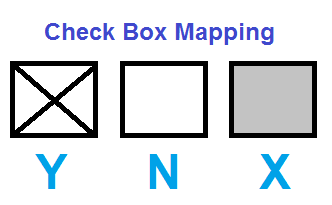 Means suppose you have specified Value When Checked property to ‘Y’ and Valued When Unchecked property to ‘N’ and the value is coming from database is ‘X’ then ‘Check Box Mapping of Other Values’ property handles to how the check box will behave in that condition, means it would be unchecked or checked or disabled. Any queried record that contains a value other than the user-defined checked and unchecked values is rejected and no error is raised. Any attempt to assign an other value is disallowed. Any value other than the user-defined unchecked value is interpreted as the checked state. Any value other than the user-defined checked value is interpreted as the unchecked state.